​​​​​​​​​In order to be eligible for Federal participation, a project must be in full compliance with the National Environmental Policy Act (NEPA) and other applicable Federal, State (CEQA) and local environmental laws and regulations. Corps of Engineers guidance for implementing NEPA is contained in ER 200-2-2, Procedures for Implementing NEPA, 4 Mar 88. Coordination and consultation with concerned Federal and state agencies on mitigation and other ecological, cultural and preservation matters should be documented in a Draft NEPA document (EA or EIS) that will be prepared and forwarded higher authority for approval for public release. Upon determination that the reports are satisfactory, the District will be directed to circulate the Draft Environmental Report as a Draft Environmental Impact Statement (EIS) and Environmental Assessment for public review and comment. Once comments are received a Final EA or EIS is prepared and (in the case of a Final EIS), the Final is filed with EPA. DMA prepared a Programmatic Environmental Impact Statement for the District’s Emergent Sandbar Habitat maintenance and creation responsibilities under the US Fish and Wildlife Service’s 2000 and 2003 Biological Opinion. The purpose of this project is to implement non-flow methods of maintaining and creating nesting habitat along nearly 800 miles of the Missouri River from the Fort Peck Reservoir in Montana to Ponca State Park in Nebraska. The project is limited to the free-flowing reaches of the river, focused on approximately 400 river miles. DMA provided planning and logistical support for public meetings and developed baseline data necessary for EIS preparation. DMA prepared the Feasibility Report and Environmental Assessment for an acid mine drainage abatement / aquatic ecosystem restoration project in Lackawanna County. PA. The Fall Brook Run watershed is located in the anthracite coal region of northeast Pennsylvania. Resulting from years of deep mining and relocation of the stream system associated with surface mining, Fall Brook Run and its tributary Murin Run have significant base flow losses. During low summertime flow conditions, reaches of both streams are dry. Historic underground mining and subsequent mine subsidence has enhanced bedrock fracture patterns of the streambed contributing to the observed loss of base flow. The recommended plan developed by DMA consisted of sealing the streambed, aquatic and riparian corridor reclamation, and reclamation of a 285 acre abandoned strip mine site. Activities performed by DMA include: water quality analysis, stream flow analysis, ecological baseline analysis, hydrologic and hydraulic investigations, geotechnical studies, plan formulation, native species planting plan development, natural channel enhancement design, preliminary and final design analysis, MCACES cost estimating, habitat analysis and quantification of ecological outputs, cost effectiveness and incremental cost analysis, economic and social impact studies, feasibility report preparation, NEPA documentation, and agency coordination and public involvement. DMA prepared three feasibility reports and Environmental Assessments for acid mine drainage abatement and aquatic ecosystem restoration projects in the Appalachian region of southwestern Virginia. DMA activities included: review of available data, site reconnaissance, development and implementation of a comprehensive water quality sampling program, hydrologic and hydraulic investigations, preliminary design and cost estimating of restoration features, preliminary economic and socio-economic analyses, environmental and fish and wildlife studies, public and agency involvement, formulation and screening of alternative plans, additional water quality sampling and flow measurements, completion of hydrologic and hydraulic investigations, final design and cost estimating of restoration features, final economic and socio-economic analyses, environmental and fish and wildlife studies, public and agency involvement, completion of plan formulation activities, and preparation of the draft and final feasibility report and NEPA document. Gowanus Bay includes approximately 130 acres of open water between Bay Ridge Channel in the Upper Bay of New York Harbor and the beginning of the canal. The Gowanus watershed is a highly developed urban area totally located in the Borough of Brooklyn, City of New York. The watershed encompasses approximately 6 square miles of mostly impervious surface. Water quality and aquatic habitat have been degraded by stormwater, sewage system, and other permitted discharges into the canal. DMA is currently assisting the New York District in achieving the P-7 Milestone for the feasibility study of Gowanus Bay and Canal, New York. DMA is perform eight tasks in support of the study effort: Assist in Coordination with the Non-Federal Sponsors, Assist in Conducting Agency and Public Coordination Meetings, Maintain the Gowanus Bay and Canal Feasibility Study GIS data base, Assist in Preparation of Draft Scopes of Work for Sedimentation and Water Quality Modeling, Conduct Biological Investigations of the study area, Assist in development of the preliminary draft EIS, Assist in Development of a Habitat Evaluation Method, and preparation of the P-7 Formulation Briefing Document. DMA conducted a feasibility study for ecosystem restoration in the drainage area of Flushing Bay and Creek. Alternatives developed include tidal and non-tidal wetland restoration and water quality improvements in the backbay area. DMA prepared the reconnaissance report and PSP under an earlier contract. Feasibility study tasks included: revision and updating the Project Study Plan; coordination with non-Federal sponsors; agency and public involvement meetings; surveying and mapping; bathymetry; and current velocity measurements; preparation of detailed work plans for feasibility study efforts, environmental baseline surveys, wetlands delineation, and preparation of preliminary alternatives. DMA efforts also included: alternative screening, formulation and evaluation of final plans, final design and cost estimating, cost effectiveness and incremental cost analysis, preparation of the AFB Technical Memorandum, and preparation of the Feasibility Report and NEPA document. DMA initiated the feasibility phase by re-evaluating the ecological and engineering feasibility of recommendations contained in the 1997 Section 905(b) Preliminary Appraisal. Feasibility phase activities performed by DMA included: update of the Project Study Plan; identify and define the location of the watershed project; obtain and analyze existing sediment data; obtain, review and prepare preliminary analyses of existing precipitation, water flow and water quality data sets; preliminary formulation of in-lake alternatives; NEPA document outline, scoping process, and coordination letters; meetings and presentations; preliminary design of watershed alternatives; bathymetry, and planning coordination for the feasibility report. 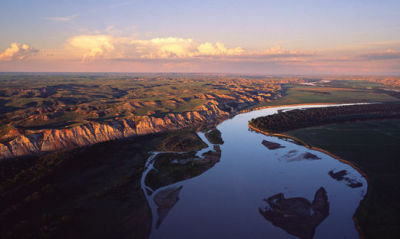 DMA prepared NEPA documentation for the sale by the Corps of lots adjacent to Fort Peck Lake, Montana and the purchase of lands suitable for inclusion in the Charles M. Russell (CMR) National Wildlife Refuge (NWF) by the US Fish and Wildlife Service. The NEPA document was an Environmental Assessment (EA) with the Omaha District as the lead agency and the USFWS as a formally recognized cooperating agency. DMA provided logistical and materials support at four public meetings in Montana (Helena, Billings, Glasgow, Fort Peck), developed read-ahead and handout materials and the public meeting slide presentation. In coordination with the Omaha District, DMA prepared a single EA addressing all four sites. DMA performed plan formulation activities and prepared the plan formulation sections of the environmental restoration reports and environmental assessments for two proposed projects along Drakes Creek, an embayment of Old Hickory Lake. Plans developed and evaluated included: environmental dredging, dike construction, and aquatic and riparian habitat restoration. Habitat evaluations and cost effectiveness and incremental cost analyses were also prepared for the study.